The 2.0 SkyActiv-G (Mazda's PE-VPS) is 2.0-litre four cylinders gasoline engine, and it was first introduced in 2011. The engine includes non-standard technical solutions, which is traditional for Mazda's engineering. The Skyactiv-G is based on predecessor the MZR 2.0 with a compression ratio of 10.0. The compression ratio of the new engine was increased up to unusual specs for gasoline engines - 14.0/13.0. Increasing the compression ratio increases the temperature and pressure in the cylinder at the end of the compression stroke and gives high efficiency and power, but also a strong propensity for detonation - explosive combustion of the air-fuel mixture, which leads to overheating and destruction of the piston rings and pistons. To protect the engine from an explosion, the engine has ion sensors built into the ignition coils. Ionic sensors are more sensitive and allow better control of the moment of appearance of detonation in each cylinder. The 2.0 SkyActiv-G engine has an aluminum alloy block and an aluminum-silicon cylinder head. There is a thinner crankshaft which is 690 grams lighter now. The engine has the shape optimized and lighter (127 grams per cylinder) pistons and connecting rods. On top of the head are the double overhead camshafts are driven by a timing chain. The chain is automatically tensioned using the chain tensioner actuated by oil pressure and the spring. The engine has four valves per cylinder, which are actuated by rocker arms with needle roller followers for friction reduction, instead of bucket tappets on the predecessor. There is the system calls Dual S-VT (Dual Sequential Valve Timing) which provided variable intake and exhaust valve timing. The fuel is injected directly into the combustion chamber of the 2.0 SkyActiv-G. That means that SkyActiv-G engine has a direct injection system and high-presser fuel pump. The fuel pump is driven directly by exhaust camshaft. The updated fuel system with direct injection provides pressure up to 2900 Psi (200 bar) because of high compression ratio and more top presser in the combustion chamber. 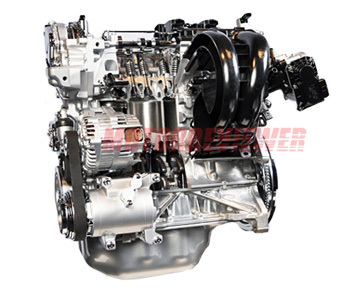 The standard gasoline engines have a conventional fuel pump pressure of 1600 Psi (115 bar). The 2.0 SkyActiv-G engine was equipped with the 4-2-1 exhaust system. 4-2-1 is the exhaust manifold configuration. This configuration reduces the resistance when exhaust gases leave the cylinders. The exhaust gases pass a longer distance and create a rarefaction wave that facilitates the exhaust from the next cylinder. In addition to increasing the power, this reduces the temperature in the combustion chamber and the probability of detonation. To reduce pumping losses in the engine and increase efficiency, engineers taught him to work on two cycles: Atkinson and the more traditional Otto cycle for gasoline engines. The first is used at low loads when there is no need for high torque. The intake valves are closed later, already at the compression stroke, and some amount of gases exits through them back to the intake manifold. That reduces the actual compression ratio and pumping losses. This cycle makes the engine more efficiently. And with medium and high loads, the intake valves close earlier (the usual Otto cycle) and the cylinders are filled. The compression ratio again reaches 14 - and the engine produces high torque. The Atkinson cycle forced engineers to include in the intake system a vacuum pump for the normal operation of the brake booster. The vacuum pump is integrated with the high-pressure fuel pump. There are more small touches like new plastic impeller for the water pump, or smaller oil pump, etc. In the result, the 2.0-litre SkyActiv-G engine is 10% lighter than its predecessor, more powerful and fuel efficient. The engines satisfy exhaust gas emissions standard Euro VI in Europe. 4.0 (4.2 US qt.) - without oil filter. Strangely enough, there are no serious problems. Since the start of sales, there have been several cases of oil pumps replacement, which for some reason did not develop the maximum pressure. It is worth noting the wear on the cams of the intake camshaft, which increases the noise of the engine. The engine produces knocking at cold starts. But then the sound disappears when the engine is warmed up. But everything described can be attributed somewhat to exceptions to the rule - the 2.0 SkyActiv-G engines are reliable enough.